The ancient world lasted about 3,500 years, rather more than the medieval and modern eras put together, so it would seem a daunting task to summarize the history and achievements of that period in just over 600 pages. The author’s success lies in his easy-to-read style of writing and his ability to summarize the key points of an era in paragraphs rather than chapters. The author is a classical historian and this shows. Egypt is allotted only 44 pages plus a few later mentions, but this is at any rate more than the Ancient Near East which merits only 17 pages before Persia. The bulk of the volume covers the well-trodden path of classical Greece and Rome. Apart from the author’s bias, this is understandable in view of the more abundant source materials from the classical world and the fact that the modern age is the intellectual heir of Greece and Rome. However, one would have wished for more of the ancient civilisations. As the author is not an Egyptologist, or Assyriologist, he has wisely sought advice from the experts who are warmly thanked in his preface. His bibliography is relatively up-to-date (the book was first published in 1996). His chapter on Egypt presents a pithy account which highlights the key points of Egyptian civilisation clearly and succinctly. He touches upon the Egyptian legacy to later civilisations both in the Near East and in Greece through literature, religions and of course sculpture. It would have been useful if he had devoted more space to this aspect. Since the author is heavily reliant on external sources for his account of Egypt, the more well-read reader might notice the occasional slip based on out-of- date references. It is a tribute to the author’s judgement that these are few and far between. Ramesses II would be delighted to know that he is still credited with 160 children rather than the more conservative modern estimate of 90. 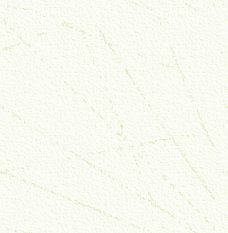 On the other hand, the author judiciously assigns the recently discovered Cretan frescoes at Tell-el- Dab’a to a Cretan merchant community rather than engaging in the rather more fanciful speculation that greeted this discovery. This book is an excellent summary of the ancient Mediterranean world where those readers interested in placing Egypt in context will find much of interest, but it is essentially a study of the classical world. Nevertheless, the author provides the essential background and a useful introduction to stimulate those readers who may wish to explore ancient Egypt in depth elsewhere. 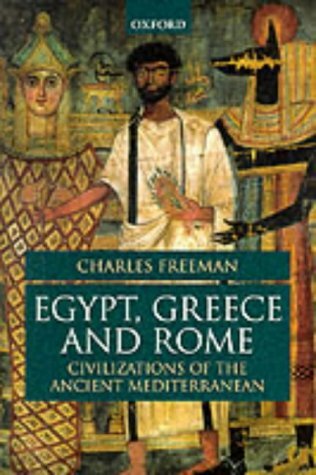 Egypt, Greece and Rome: Civilisations of the ancient Mediterranean, by Charles Freeman is published by Oxford University Press. It seems to me that ancient Egyptian scribes would approve of current methods of recording and storage. There’s a lot of material packed into 2 small CD’s, with a third CD now available too. This set will appeal mainly to relative newcomers to Egyptology, and to older children. It is inevitable that sets of this type will be a curate’s egg, and that is the case with this one. The section relating to everyday life in ancient Egypt is excellent, and made the whole thing worthwhile. The virtual cruise, too, is fun, and it might be at this point that nostalgia seekers who haven’t been able to indulge themselves with a trip to Egypt recently would settle down to watch. "Hey, replay that!" said someone in the office, who is obviously overpaid and underworked, as a veiled woman sashayed across the screen. With the map of Egypt laid out below, it was possible to fly from site to favourite site, replay and move on. Taking virtual tours of tombs in a rather games-like format promised much, but, in the case of Tutankhamun’s, inevitably couldn’t deliver. Nefertari’s tomb was much better. Not being a regular games player, it took a while to control the cursor and I ended up, virtually, flat on my back staring at the ceiling on a couple of occasions. To access the various options, other than the main menu, you are spun round dizzily while you make an attempt to click on a pyramid, a mask, an obelisk and so on. This is a bit queasy, but is probably the sort of thing that children, in particular, expect. What with all the gyrating and lying on the floor it was beginning to feel like an undergraduate party, and so I decided to sober up by accessing the hieroglyphs option. Hmmm. I am still trying to work my way through the not too friendly menu, and exercises. The hieroglyphs option doesn’t seem to fit easily with the rest of the information, which is rather touroriented. I feel as though too much is trying to be done here. With regard to the "mysteries" aspect of Egypt, the CD’s are, to say the least, sketchy, and so if anyone is expecting X-files stuff, forget it. "The pyramids are very big and it would be difficult to build them today". So there we are. Mysterious Egypt, 6000 years of civilisation on 2 (or 3) CD-Roms, is published by Emme/Acta. Price not available as we went to press. Over the last few years, a number of books have been published which are either all, or in part, about the Giza necropolis, site of the Great Pyramid of Khufu, the pyramids of his immediate successors, and of the Sphinx. Publication of these books often co-incided (by design) with television documentaries. Because the findings for the authors were seen to be controversial, and/or because the authors and publishers were good at publicity, numerous articles in newspapers helped to promote the various theories, which were also aired and debated at great length over the internet. The books, consequently, have sold in vast numbers and have become "best-sellers". Now, looking at all these publications collectively, the theories put forward include: The Pyramids being built by an ancient, very advanced and now ‘lost’ civilisation, with the Sphinx being dated around 8,000 years earlier than the archaeological evidence indicates; that the Pyramids, and in particular the Great Pyramid, were somehow repositaries of ancient wisdom and knowledge that is only now being "unlocked" by the authors; that there is a "Hall of Records" somewhere near the Sphinx where lost wisdom is stored, along with the Ark of the Covenant and the answer to all the mysteries of the world (hopefully including an answer to the question why, when six socks go into a washing machine, only five come out?) The answer to this, Bob, is that washing machines are a portal into a multidimensional universe and that, like the biros in the Hitchhiker’s Guide, the socks are all hanging out on their own planet waiting for their other halves to turn up - Ed that there is a "Sphinx" and possibly pyramids on Mars(!) that there is some connection to the lost civilisation of Atlantis. Add to all of this a great conspiracy theory, that the Egyptians have accessed all this information but are not disclosing it, and you have some potentially volatile and fascinating reading. Not surprisingly, most Egyptologists, and in fact even people with only a basic knowledge of ancient Egypt, were entirely dismissive of virtually all the theories put forward, many of which were not in fact new, but have been around in some shape or other for over a hundred years. The interesting thing about Egyptology is that it is possible to invent any theory and then find five facts to prove it. It can make for entertaining television programmes and books, and to many lay people, the theories may appear to be convincingly put forward and proved. However, most authors seem to be very selective in their evidence and ignore completely any facts which damage their theories. Whilst there are a number of excellent books written by Egyptologists on the subject of the Pyramids, they do not get the publicity they deserve. In any case, the Egyptologists are reluctant to enter the debate on possibly far-flung theories and tend to stick to basic facts and hard evidence, which is the nature of Archaeology as a science. There are publications and authors whose subject matter and interpretation of facts are poles apart. Enter Ian Lawton and Chris Ogilvie-Herald, authors of Giza - the Truth, which was first published in 1999 and which has now been revised and republished in paperback. The revised version includes new information included in an "epilogue". I will admit that when I first saw copies of this book I thought it was yet another volume putting forward yet more strange theories and ideas, cashing in on interest in the story. How wrong could I have been! The authors look at the site at Giza and the exploits of the early explorers and treasure hunters, which is fasc- inating and informative reading in itself. Chapters follow which deal with how, why and when the Pyramids were built. Putting the Giza group of Pyramids into their historical context, as the authors rightly point out, is critical to understanding the site. Moving on to modern exploration of the site, the authors look in detail at all the various theories and claims for the site. They present the information clearly and logically, examine the facts available and come to a conclusion on each point. For those who are fairly knowledgeable about Egypt and the site in particular, it is not surprising that many theories are dismissed as unsound. The site at Giza is vast and there are many aspects of the site that are still a mystery to us, and may well remain so. The authors, having presented the theories and known facts are not above saying that they have no idea in some case what the real answer is, but they imply that the search for facts and hard evidence is, and will always remain, paramount. The authors seem to be impartial, too; whilst being critical of some authors, they do acknowledge when an important issue has been raised and where the debate which has followed has actually improved our knowledge of the site or actually encouraged specific and more scientific research. Having not read some of the books referred to in Giza - The Truth, sometimes I found the "so and so said this, then so and so said that" a little hard to follow. But, having said that, this is a substantial piece of work with 573 pages and the authors have put together a remarkable volume and an excellent read. 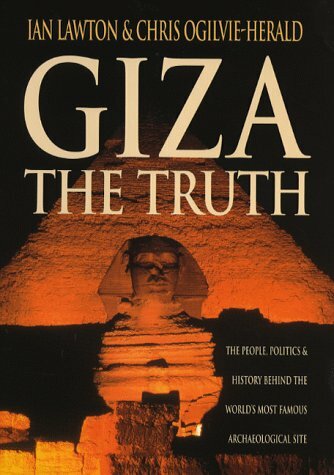 If you have read all the alternative books on Giza, then Giza - The Truth, is an absolute must. If you are just interested in the site and want to find out what has been happening there for the last 200 years, this book is also a must for your collection. As I registered students for a forthcoming class, there was a gang of small children hanging around the desk desperate to look at the magazines and to tell me what they knew about ancient Egypt. "They wrapped them up in bandages and buried them in tombs with lots of gold." "There's a big thing with the body of a lion and the head of a man." "The king was called Pharaoh." "That's a pyramid." Their constant, lively, enthusiastic chatter was in the background as I signed up adults for the classes, making me aware once more of the immense draw of Egyptology for students of all ages and backgrounds. Then it struck me; we take it for granted, now, that so many people know something about the subject, and that some individuals, not necessarily professional Egyptologists, possess in-depth knowledge of a particular aspect of it. It is almost commonplace. All this has been achieved in just over 200 years. Before that, the history, language and achievements of Egypt lay hidden, often literally hidden on monuments in sand. A few individuals made an attempt to study aspects of Egypt and it was remembered in drama and histories. Then came the first scientific investigation of ancient Egypt under Napoleon that would lead to the whole opening up of Egypt in the 19th century to scholars, travellers, tourists, politicians and adventurers. At the recent Buckfast conference, Dr Bill Manley of Glasgow University argued the point, with reference to Petrie, that it was not possible to separate cultural theories regarding the origins of Egypt from Petrie's own political views. The two were interlinked. This book by Ronald Ridley is not a book about the history of Egyptology. 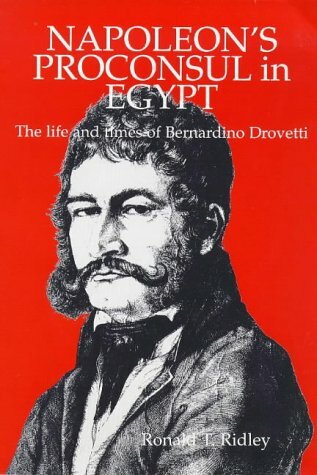 It describes in very great detail 19th political and social developments leading to the emergence of modern Egypt with which, like it or not, cultural and historical investigations were and are inevitably entwined. The children who watch programmes on the television about Egypt are not interested in these political aspects, and this is probably true of the majority of students and modern visitors to Egypt. However, for those that are, and have a decent grasp of the history of the period already, this book provides an in-depth insight into one man who played a role of great importance during the period, and the people and events around him. Imagine a time when the groups and factions within Egypt and the European powers attempting to control or influence them were so embroiled in the machinations of international diplomacy that even animals could be used as pawns in the great game. "It is hard to imagine that, in the midst of these international crises, the French Consul-General in Egypt was much concerned with a giraffe. At the end of 1825, in the Sudan, two young specimens had been captured and sent to Mehemet Ali. Drovetti had recently been instructed to try to obtain animals to send to the zoo in the Jardin des Plantes. He instantly applied for the giraffes as a gift for Charles X. Not surprisingly, Salt almost simultaneously asked for them for George IV. The Pasha fortunately had two, so that they could each have one, only one was decidedly healthier than the other. Exhibiting the wisdom of another Oriental ruler, he allowed the two consuls to draw, and Drovetti triumphantly announced that the lot had favoured France. 'Our giraffe is sound and vigorous, while the one which fell to the king of England is sickly and will not long survive. ' He was right: it died at Windsor in August 1827. " I finished this book with a determination to re-read it and to attempt to seriously acquire a better knowledge of the politics of the period, a subject that previously held little interest for me. Through reading it for a first time, I began to appreciate the importance of having some knowledge of this subject. It is fundamental to understanding the struggles of the Egyptian people themselves to achieve identity rather than have it put upon them by others, and so to understanding the modern Egyptians, who still welcome their visitors so warmly, and with such desire to make the best of the past. This issue's review panel were Robert Partridge, Miriam A Bibby and Dr Morris Bierbrier.